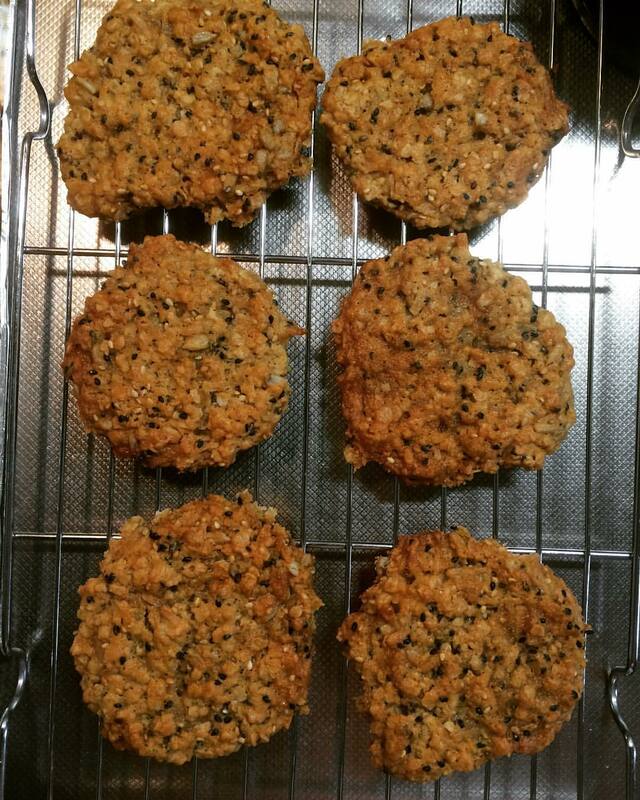 Monday was ANZAC Day, and while I am neither Australian nor New Zealander, I like ANZAC biscuits, because they remind me of chewy macaroons/oatmeal cookies. I posted about this many moons ago here. This time, I tried Nigella Lawson's recipe. 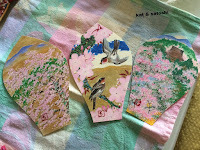 NOTES: I love the idea of adding the seeds! 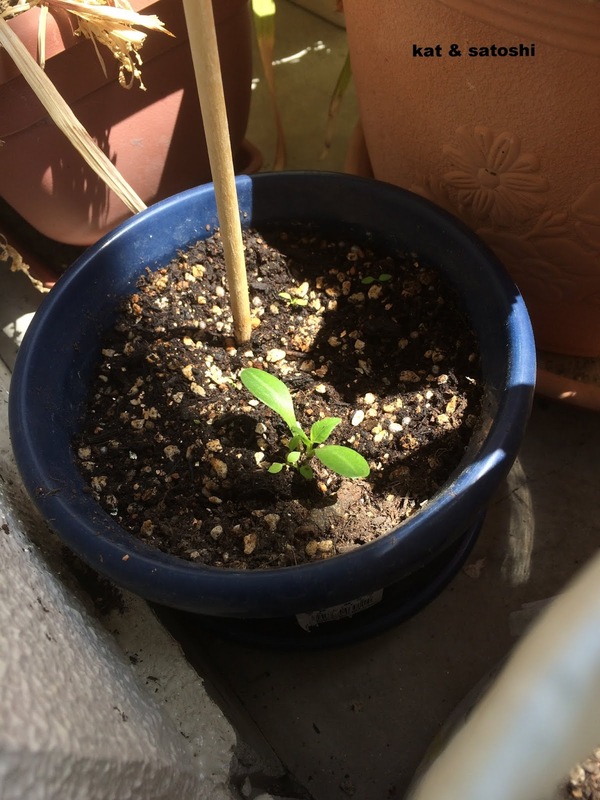 I didn't have pumpkin seeds, so I left it out. I also used black and white sesame seeds. 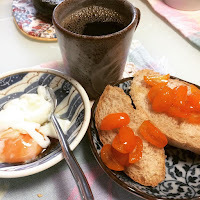 I didn't have golden syrup so I just used kuromitsu (thin Japanese molasses). Also the coconut that I have is sweetened, so I just used that as well. 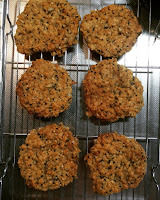 Nigella used sprouted oats, but I used regular oats. I also cut the recipe in half so I only had 7 cookies. It's the start of Golden Week here. We may be off the grid for a couple of days, will talk to you soon! With the kinkan (kumquat) that I received from Michelle, I tried a recipe that I've had bookmarked for awhile...Kumquat Conserva. The recipe only calls for 4 ingredients...vanilla bean, sugar, water and the kumquats. The hardest part of this recipe was de-seeding the kumquats. My conserva didn't turn out as "jammy" as I envisioned it would. Still, this was delicious on toast. I think it would be nice with plain yogurt too. 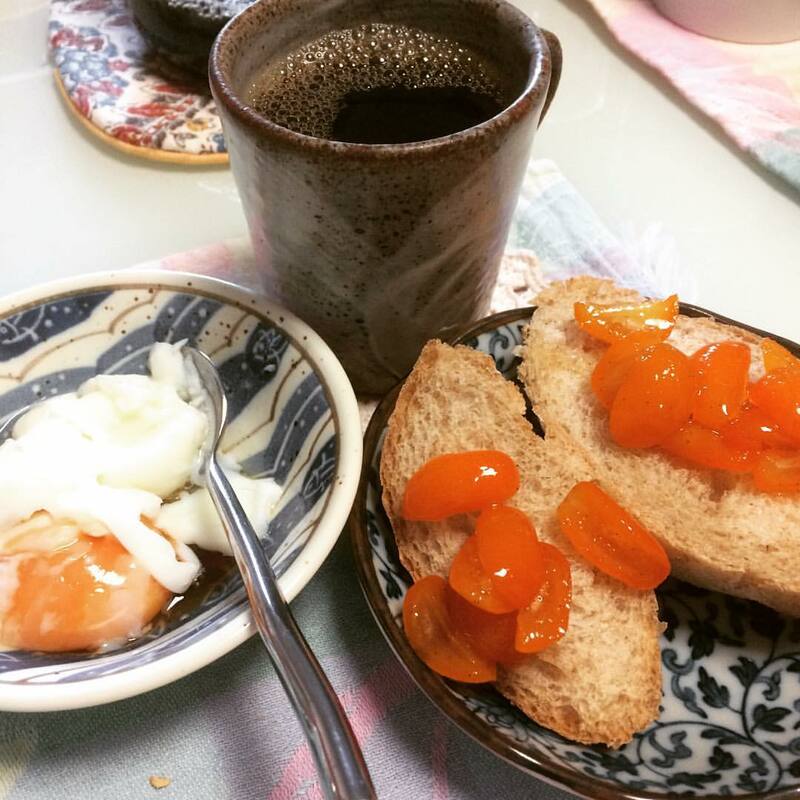 Kumquat Conserva : scribbled down from "Sunset Magazine"
NOTES: not sure where I went wrong but my conserva didn't have much liquid. Still I liked this and would definitely make this again. 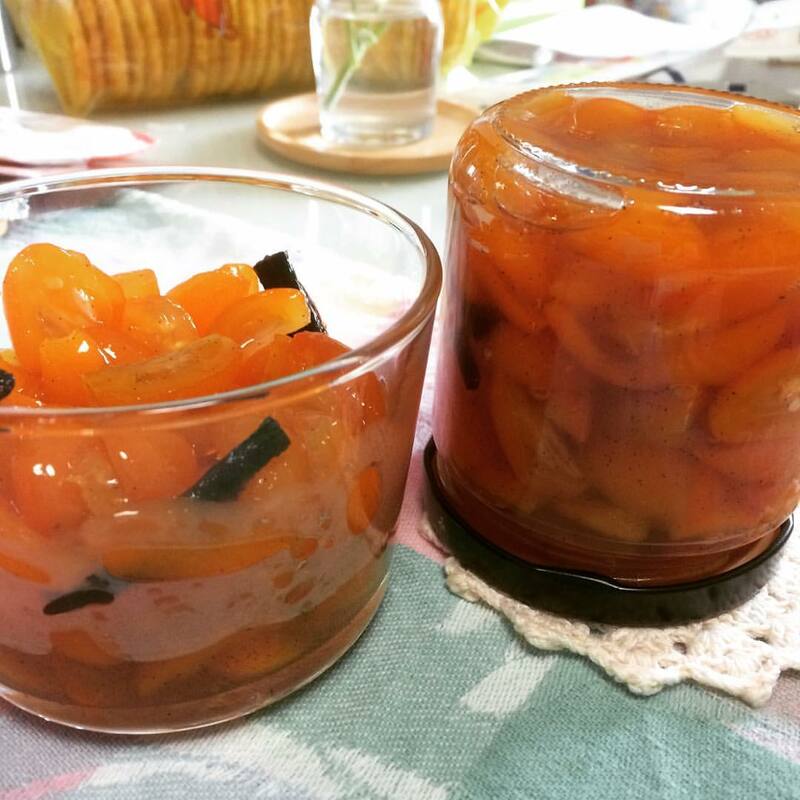 I sent a bottle of the conserva (in the first picture) to Michelle, hope she likes what I did with the kumquats from her relative's tree. 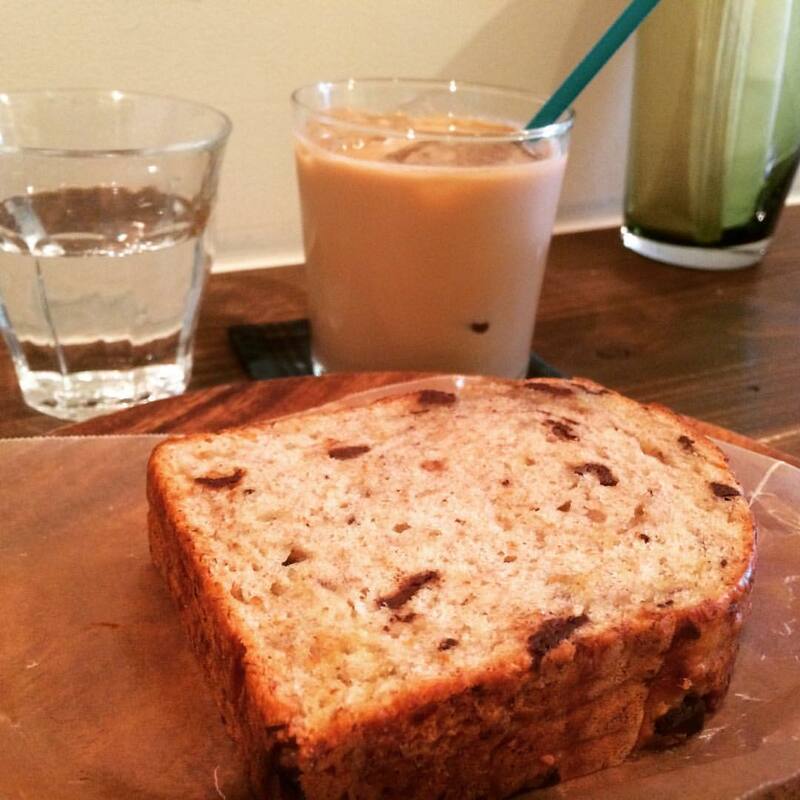 Sunday started out with breakfast at a new cafe, Ii ichinichi no cafe (literally good day cafe). 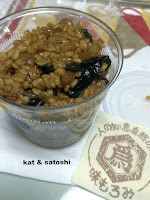 Satoshi and I both ordered their "itsumono" (the usual)...580 yen (tax included) each. 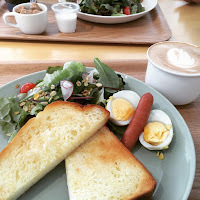 I added a cafe latte, so my meal was 180 yen more. 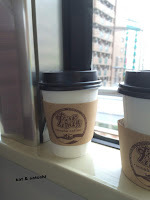 I loved the quiet atmosphere and free wifi. They recently opened the Minoh Beer Warehouse. Their original location is now only used as their brewery. Satoshi went with a half pint of Pilsner and half pint of Osaru IPA. I went with a half pint of their mugicha bitter (barley tea bitter), the tea was undetectable. We also tried some of their food items...hot dog (nice snap) with curried cabbage, lots of mustard, ketchup & relish...their beer battered karaage (fried chicken) good with the squeeze of lemon and their fries (could've been crispier). 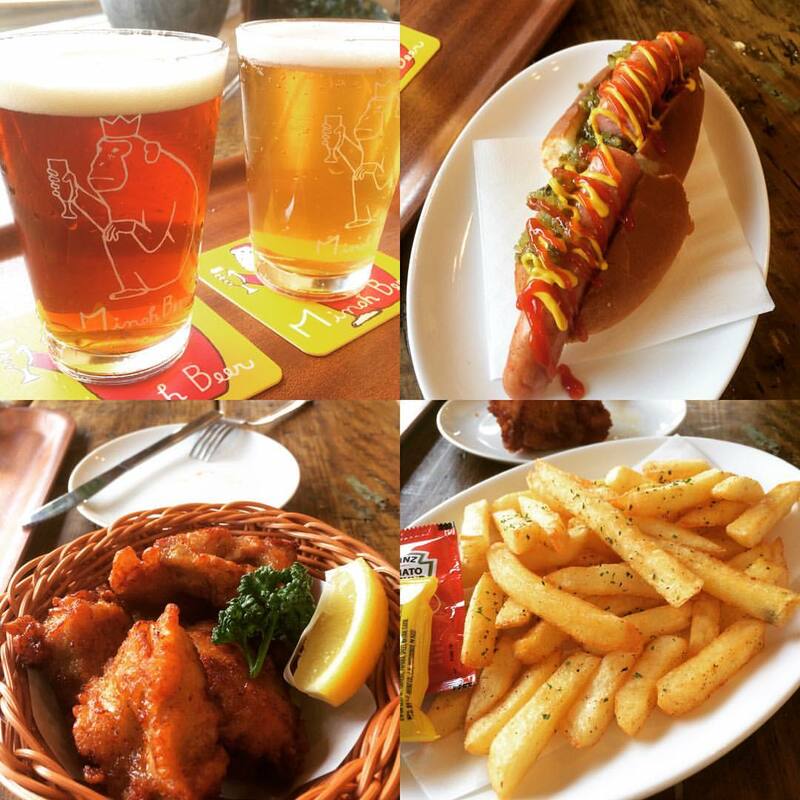 They also have other items like pizza and curry and other types of pupus (appetizers). We'll be back to both places. Saturday, after lunch, Satoshi and I went to check out the Noda Fuji. 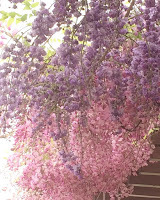 This year the strands of fuji (wisteria) weren't too long. After chatting with one of the volunteers, he mentioned that all the weird weather was to blame. 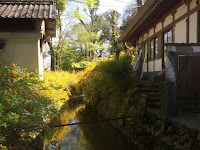 He did recommend a spot for us to check out, near the Ajigawa (Aji river). 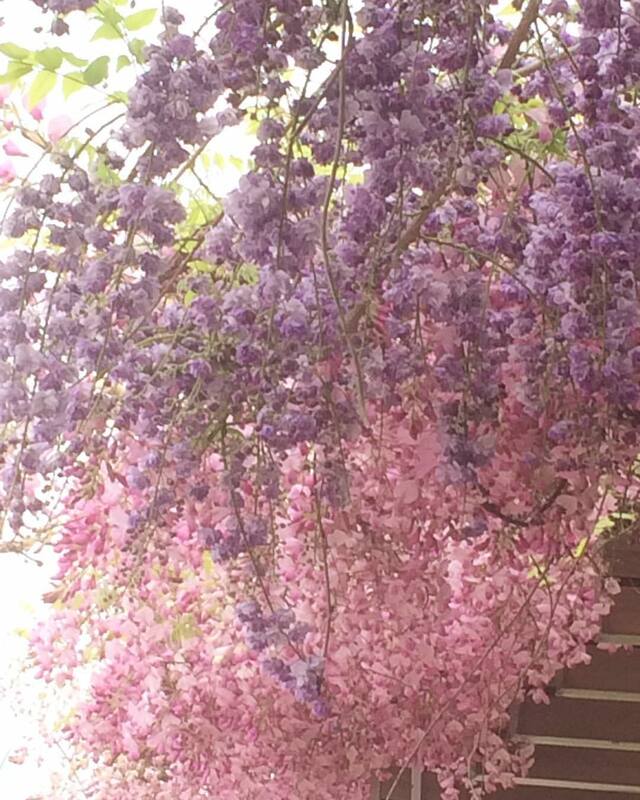 It was the first time I've seen pink and double wisteria. 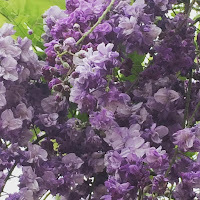 The fragrance is quite heady, but I like it! On Saturday, we got to meet a blog friend, Michelle of Desperately Seeking Crab. 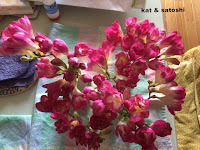 She's not blogged in awhile and over the years we have kept in touch through FB. She had contacted me that she would be in Osaka and if I would like to meet up. 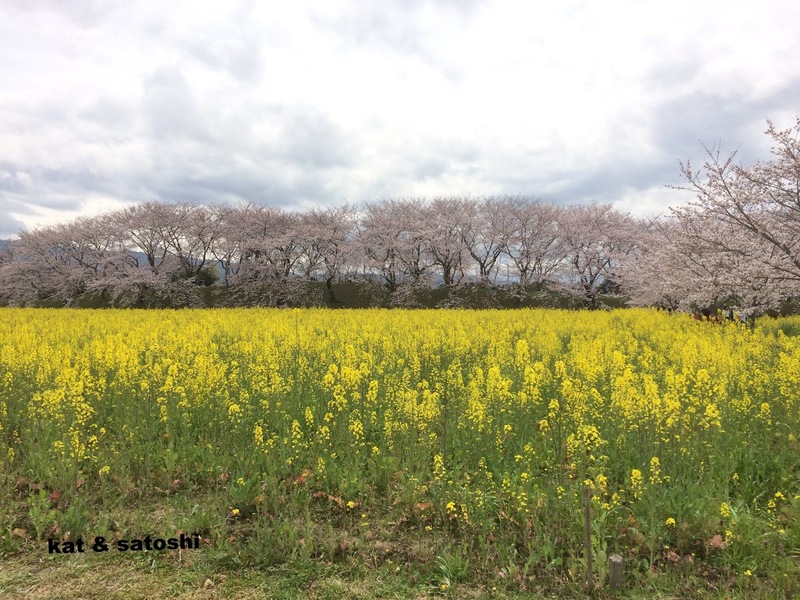 Luckily, we met on Saturday, so that Satoshi could also meet her and her family. After a little shopping, they treated us to tempura for dinner at Naniwa Hyoten. And then we went up to the Floating Sky Garden, to see the city lights. She was also kind to give us these new Tim Tam flavors and some kinkan(kumquats) from her relative's tree. It was nice to finally meet up and we hope they had a nice time too. Thank you Michelle for a great time! I've told you before how easily influenced I am by television. 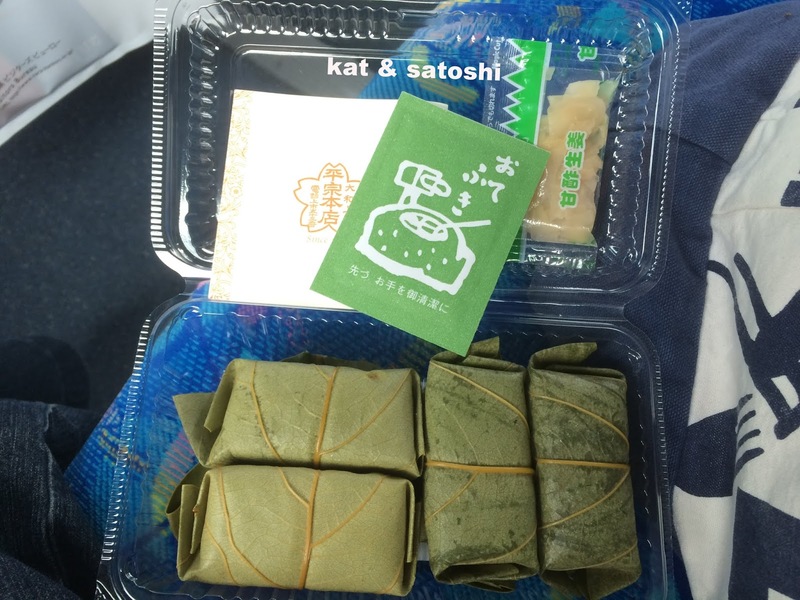 Well, last night on a program called "Matsuko no shiranai sekai" (the unknown world to Matsuko), there was a bento specialist and she showed different dishes that are good hot but better when served cold. One was this spring cabbage shumai. The type of shumai she was showing was similar to the type where they cover the shumai filling with julienned shumai wrappers then steam. Her version though, used julienned spring cabbage in place of the wrappers. 1. Pulse 300 grams of chicken breast with the cornstarch, ginger and hoisin sauce in a food processor just until it comes together. 2. Julienne the leaves of spring cabbage. 4. 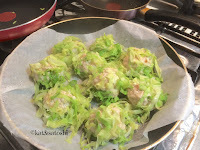 Take a small handful of cabbage, place a ball of chicken mixture on top and mold the cabbage with your hands, kind of like making musubi. 5. Place onto parchment paper which you have placed on a frying pan. 7. Put about 1/4 cup water in between the parchment and frying pan. NOTES: these were super easy to make. I would up the hoisin sauce to 2 teaspoons or serve with shoyu as there wasn't too much flavor. But I did enjoy the ginger flavor and love the idea of cabbage being a part of this dish. I think you could use regular cabbage, though I think you may want to blanch/wilt it before using. Spring cabbage is usually more tender than the other types of cabbage we see during the rest of the year here. 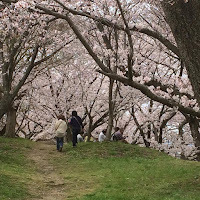 We were invited by Satoshi's co-worker, Y, to join he and his wife at Ninna-ji to see late blooming sakura (cherry blossoms). 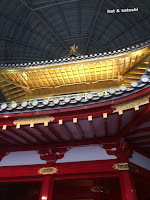 It had been over 10 years since the last time we visited Ninna-ji, so it would be a nice chance to re-connect with it. Luckily, the rain had cleared up by the time we headed out and it was actually...sunny and hot! 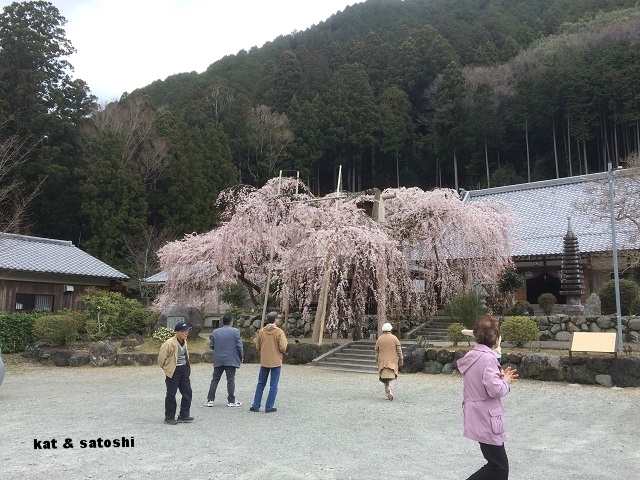 Before going to Ninna-ji though, we stopped at Matsuo Taisha near Arashiyama. 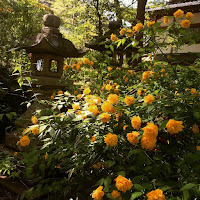 The yamabuki (Japanese rose) was in full bloom...the yellow was so pretty! Our next stop, Otagi Nembutsuji...a peaceful oasis with 1200 rakan (stone statues representing the disciples of Buddha), made by many people from various areas of Japan, during the reconstruction of the temple between 1981 and 1991, some are humorous, it was nice to look at each face. Down the hill from Otagi Nembutsuji, is Adashino Nembutsuji. I thought I had written about this spot, but it was probably pre-blog. 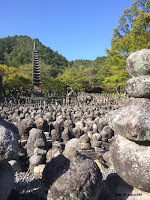 Adashino is the name of the area and is also the area where the dead were buried in ancient times. 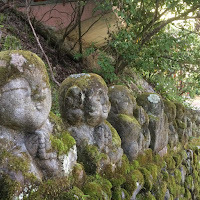 The temple was founded by Kukai (Kobo Daishi), and it is here that the dead were buried in the 9th century. Apparently, only higher class people received gravestones back then. Throughout the property there are about 8000 gravestones. Every August 23 and 24 at twilight, they light more than 1000 candles as offering to the gravestones and the ceremony is called "Sento-kuyo". From Arashiyama, we then made our way to Ninna-ji. The grounds were lit and there was also a 4 piece string ensemble playing some melodies. 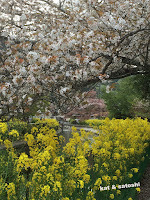 There were some trees here and there with blooms. 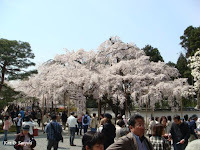 Unfortunately though, most of the sakura had already bloomed and the tree's leaves were coming in. 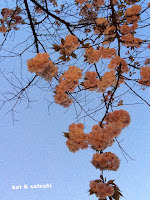 Still, it was nice to view some sakura. 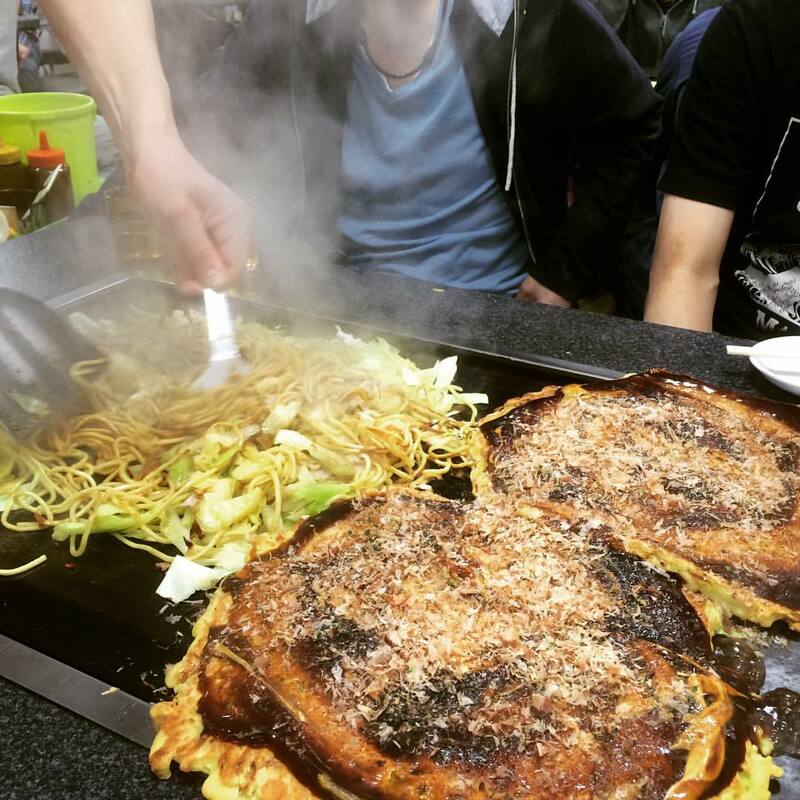 And if you look at the picture carefully, you'll notice that the okonomiyaki is "overflowing" on the griddle. This place has been in business for over 20 years and is popular with families and college students. When we got there the line was out the door! And the prices were so cheap! For 2 okonomiyaki, yakisoba and 3 large bottles of beer, it was only 3780 yen (tax included). The scary part was watching the staff put mayo and sauce on the okonomiyaki, they don't skimp, I swear the guy put half a bottle of mayo and sauce on...eep! 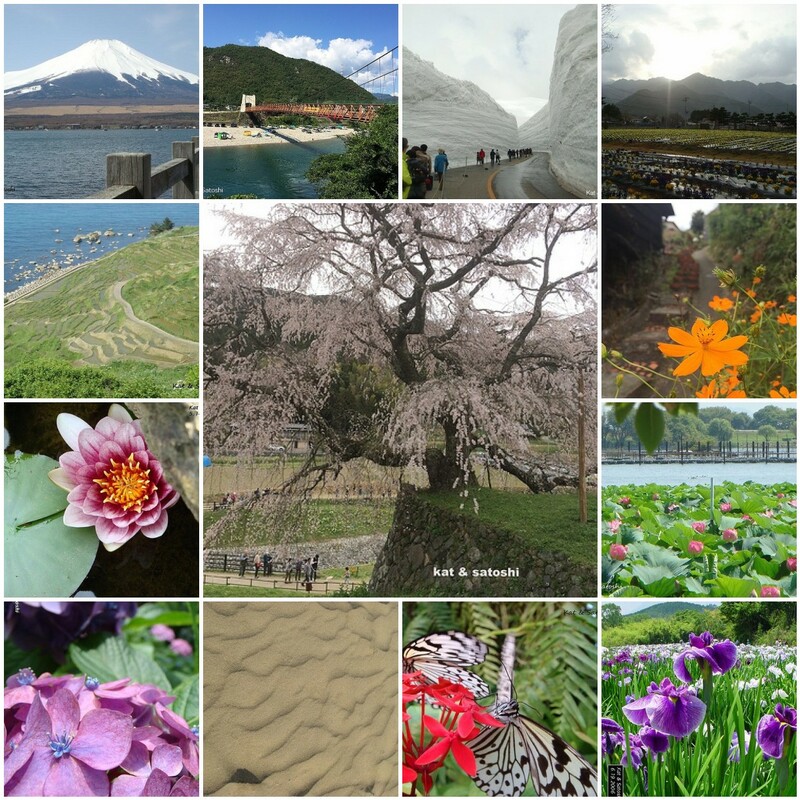 With all the broadcasts of the recent Kumamoto earthquake, getting out and about was a nice change of pace. Thanks Y and his wife for a great day. 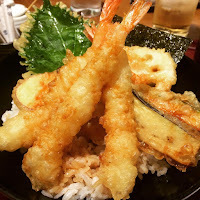 Saturday after Satoshi's German class, we had lunch at Yamamoto, a tiny yoshoku (western-style) shop. When we arrived a customer was finishing up his lunch and then we had the whole place to ourselves. 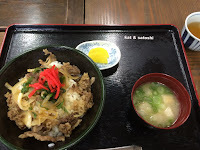 Satoshi ordered the pork steak, a pork chop cooked with salt and pepper then topped with a pat of butter...800 yen (tax included). 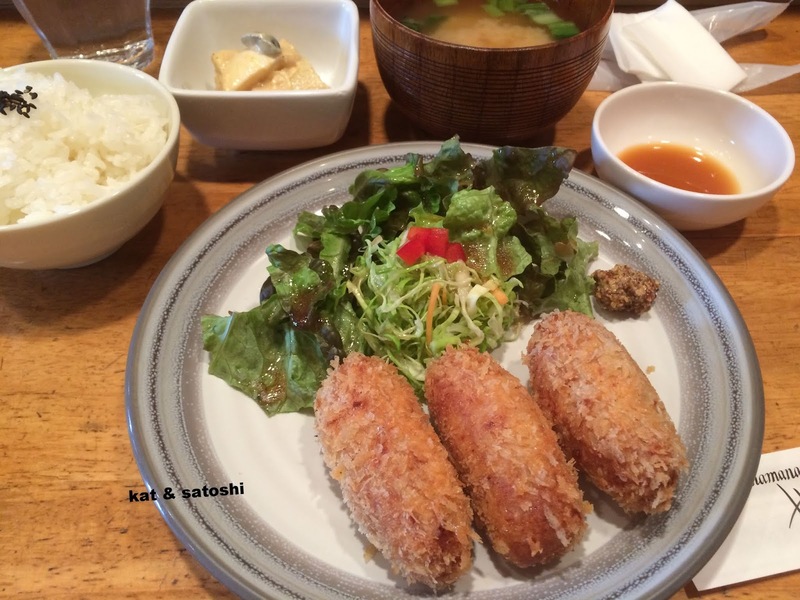 I went with the Yamamoto croquette...800 yen (tax included). 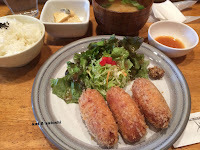 I loved how the owner/chef added a little corned beef to his croquettes...it reminded me of corned beef patties except that they were deep fried! When I asked him about the corned beef, he was surprised that I knew about corned beef as many Japanese do not eat it or know about it. I then told him that many people in Hawaii eat it and that I was actually a foreigner, he again was surprised. 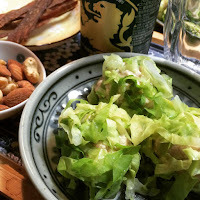 His potato salad (in the tiny white dish) with the addition of tuna also reminded me of something I've had in Hawaii. We want to try other items on the menu...we'll be back. 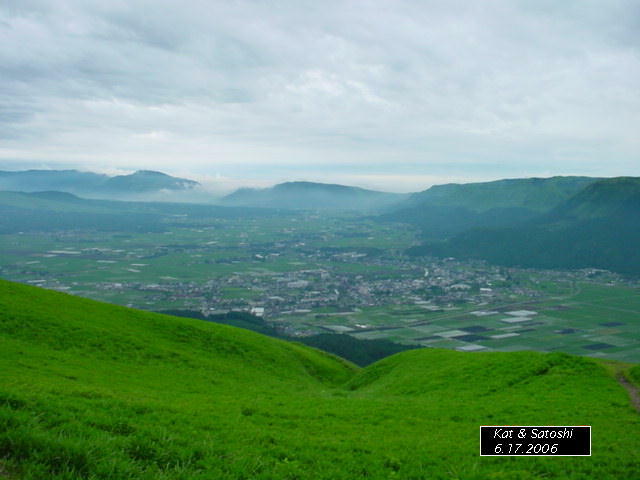 (photo taken at Daikanbo Observation Point, Kumamoto in 2006) Huge earthquake last night in Kumamoto and parts of Kyushu. I think they said it was a 7?! They are still trying to assess the damage, but it has been hard since the aftershocks have been almost non-stop for them. Sending good thoughts and prayers to the affected areas. It's been about 6 years since I've planted the freesia on our lanai. I must say this year we had a LOT of blooms. 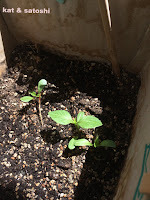 And I'm crossing my fingers that I'll be able to show you some dahlias in June. About the middle of March, I planted the seeds that we got from our visit last October. 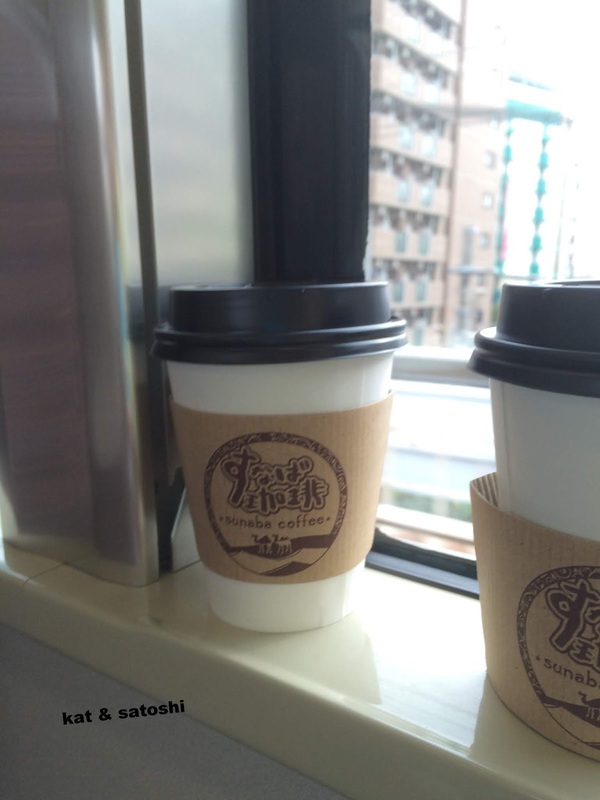 We recently tried ZiZi Bake, a tiny cafe in Tanimachi. I was a bit disappointed with their banana chocolate bread, it was quite dry. 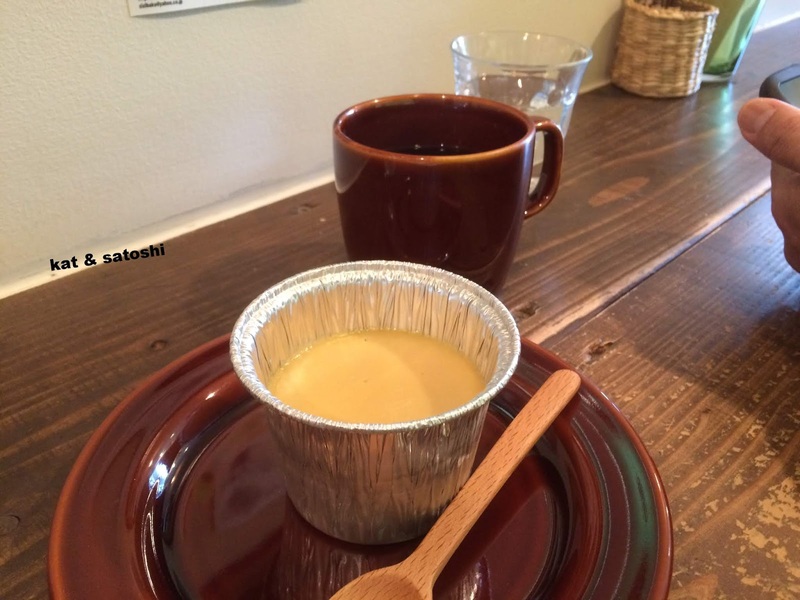 On the upside, Satoshi's Anno-imo (a type of sweet potato) pudding was super rich and creamy! 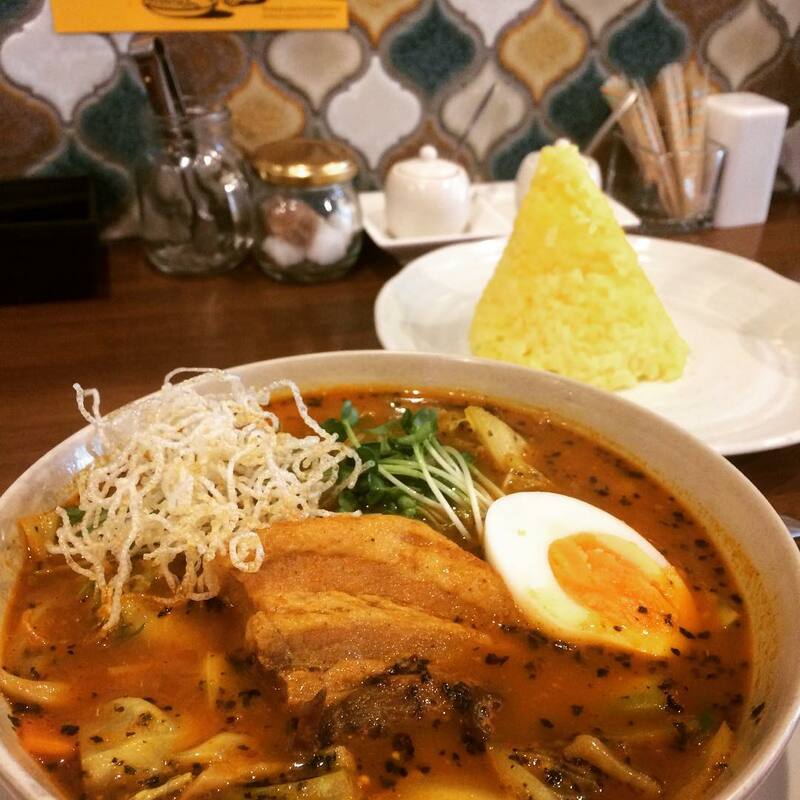 I wouldn't mind trying their curry next time...I'll be back. 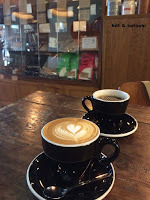 I've had Cafe Matin bookmarked to try for some time now. 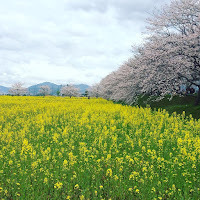 The thing about Minoo is that it is quite a large area and for us we either need to be able to walk to the destination or take some type of transportation like bus or train. Cafe Matin is in an area of Minoo that I need to take a bus, plus walk, so I finally got around to trying them yesterday. The interior is laid back with antique furniture here and there. My only peeve is that they allow smoking. 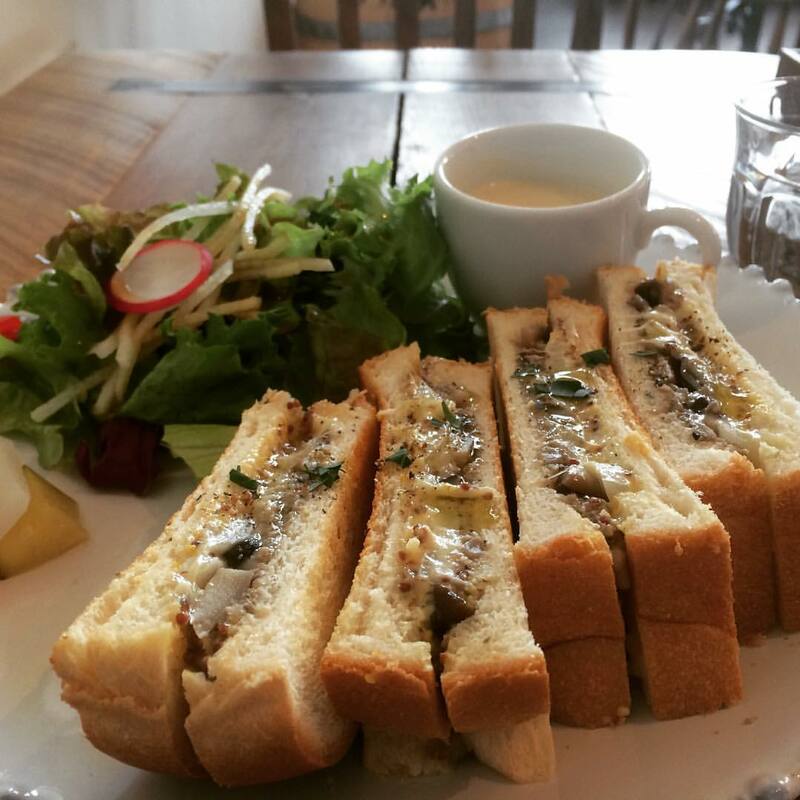 I ordered the mushroom cheese sandwich...1100 yen (tax included). This came with a salad, cream soup, some pickles and choice of drink. I chose hot coffee because the wind was blustery and icy. Aside from the smoking this place was nice. 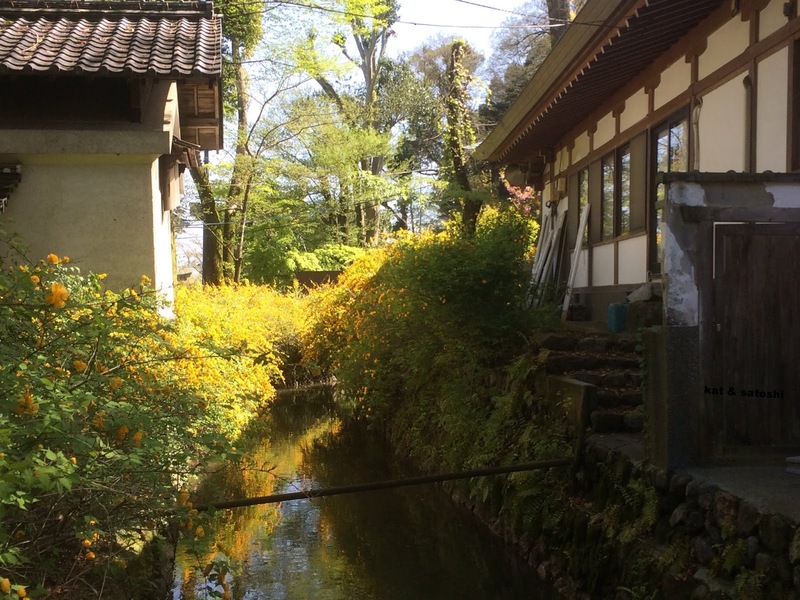 Yesterday, we headed out quite early to Hikone. 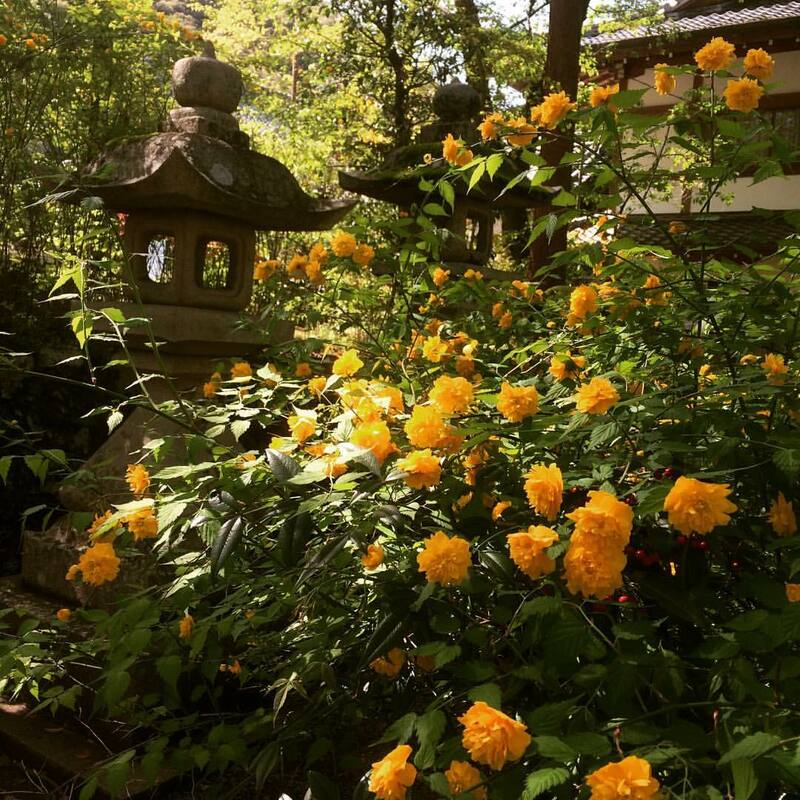 It's been a year since Satoshi's grandfather's 50 year service and we wanted to bring some flowers to his grave. 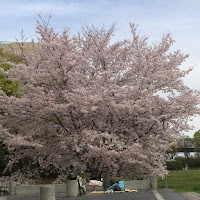 We also wanted to check out what was left of the cherry blossoms. 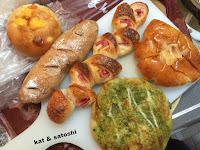 On the train we shared a variety of baked items (ginger cheese roll, fig & walnut bread, bacon epi, cream pan & basil olive bread) from Manpuku Bakery. 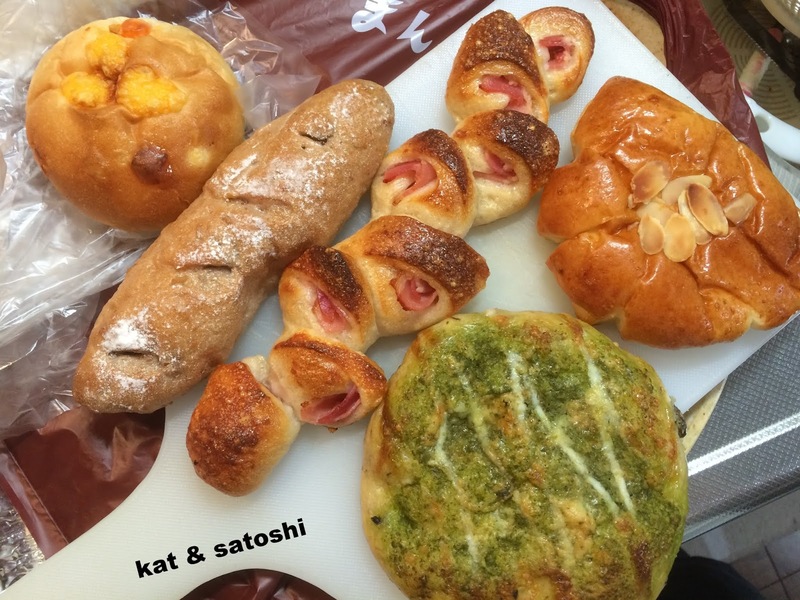 It was our first time buying items from here and they were so good, next time I go to Kitahama, I'll have to pick up other items to try. We also had a cup of Sunaba Coffee. 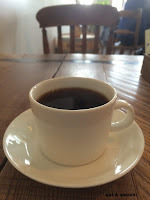 This coffee is from Tottori prefecture, it was siphon-style, but had been sitting out for a while, so it wasn't too good. After arriving in Hikone, we decided to have some coffee at Micro-Lady, while we waited for the florist to open. Cappuccino for me and a house blend for Satoshi...way nicer than the cup we had earlier. 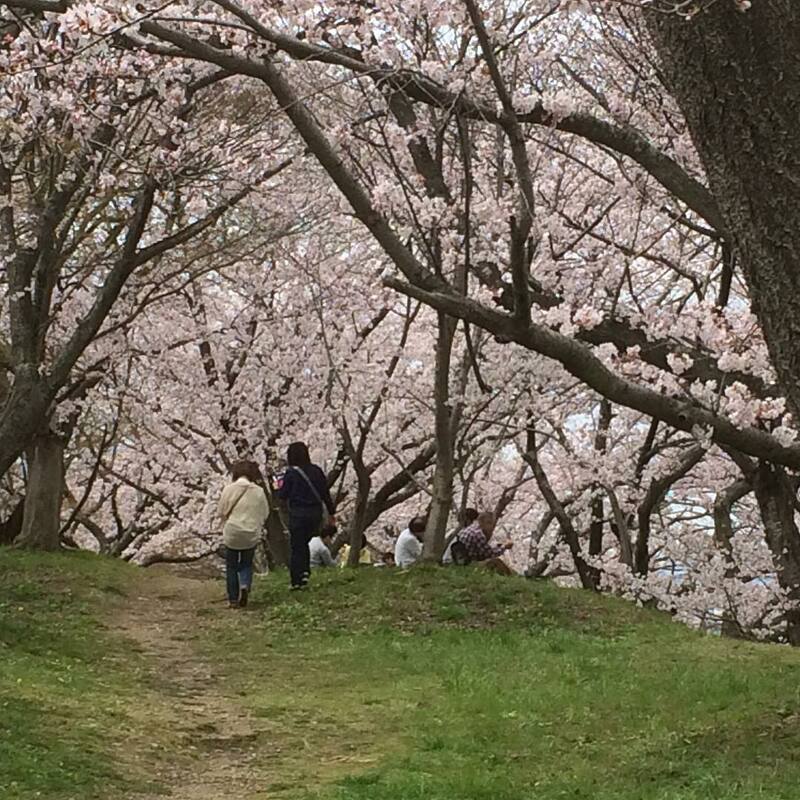 As we walked towards Hikone Castle, we were surprised that there were quite a lot of blossoms to see. 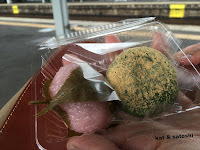 We then grabbed some sweets from Kimura Seika (a sakura mochi for me and a kusamochi for Satoshi) and headed to Azuchi. 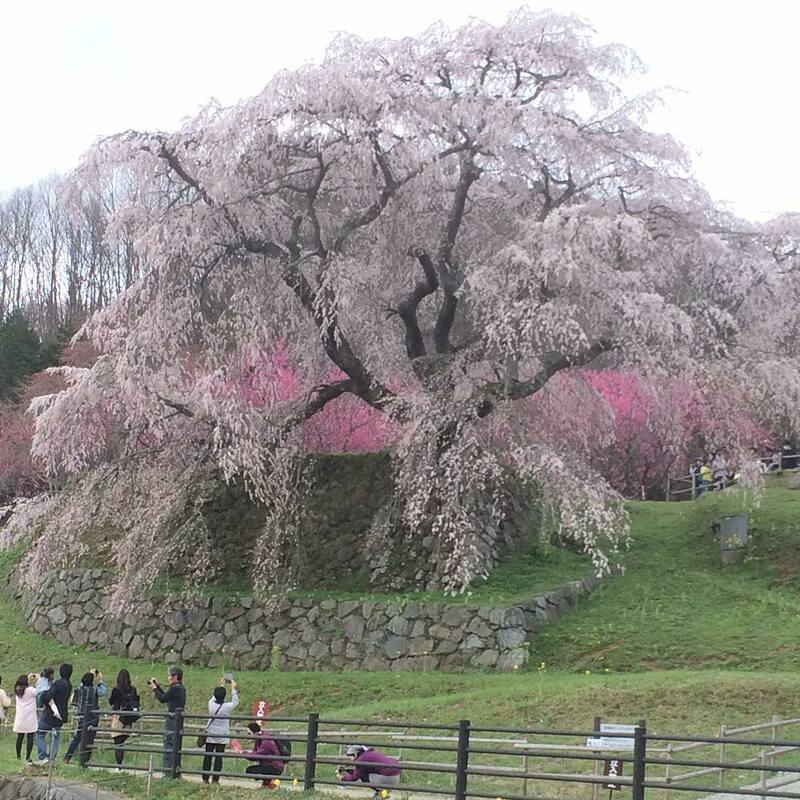 Azuchi is the area where Oda Nobunaga built a 6-story castle called Azuchi-jo. 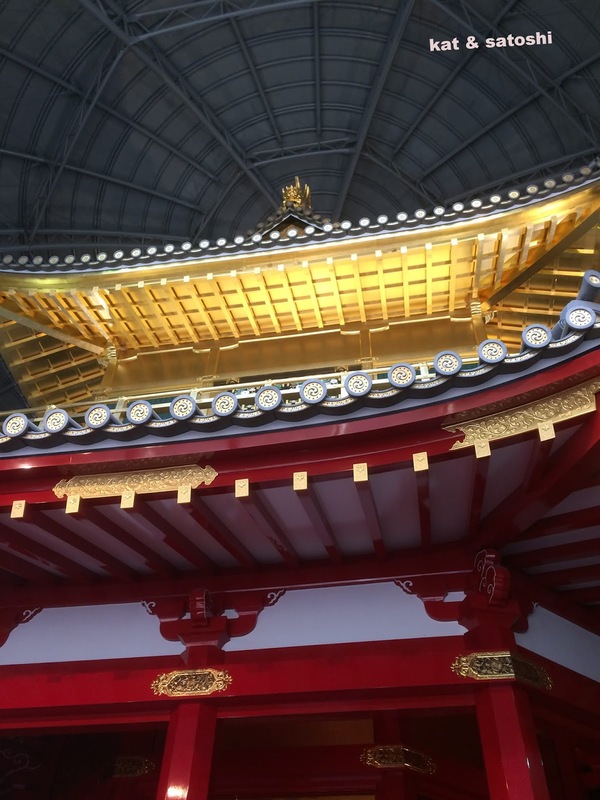 The castle only lasted 3 years before it was burned down when Oda Nobunaga was killed. We didn't have enough time to go up to see the ruins. I'm glad too...look at all those stairs! Luckily, we rented some bicycles too, walking to all these areas would've taken us forever! 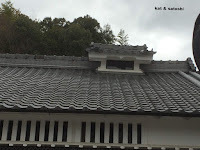 One area we visited housed a replica of the top three stories of Azuchi-jo. It's so big that you can't really get a clear shot of the whole thing! 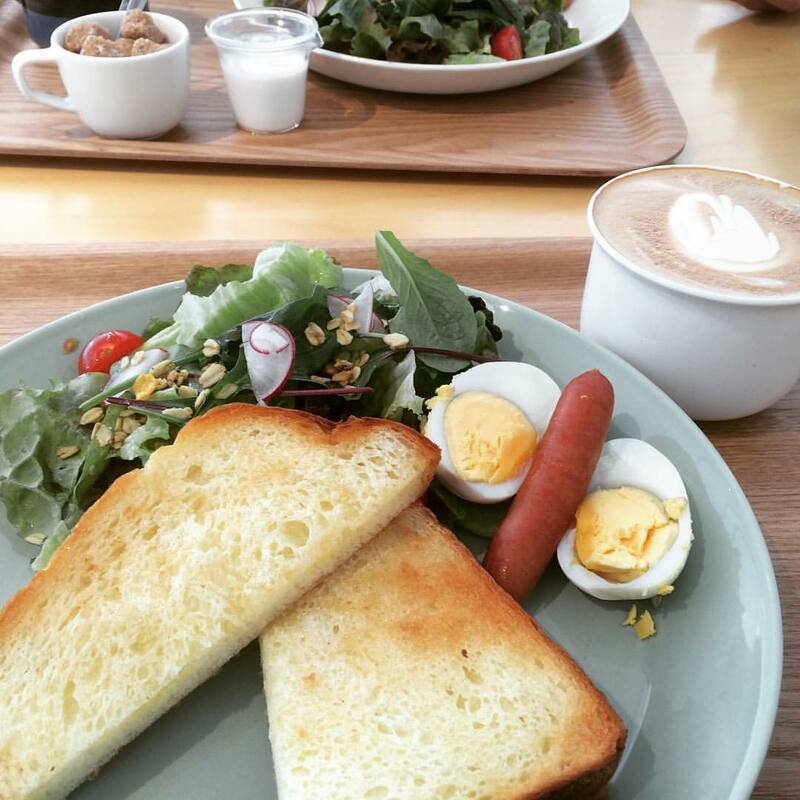 After returning our bicycles, it was nice to finally be able to have something for lunch. We had Omi beef bowls at Sawae-an which really hit the spot! 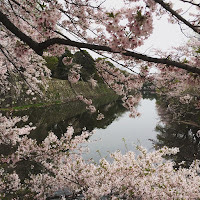 Then we went back onto the train to the Yamashina area to check out their cherry blossoms along a canal. I've seen this on tv many times and wanted to see it for myself. 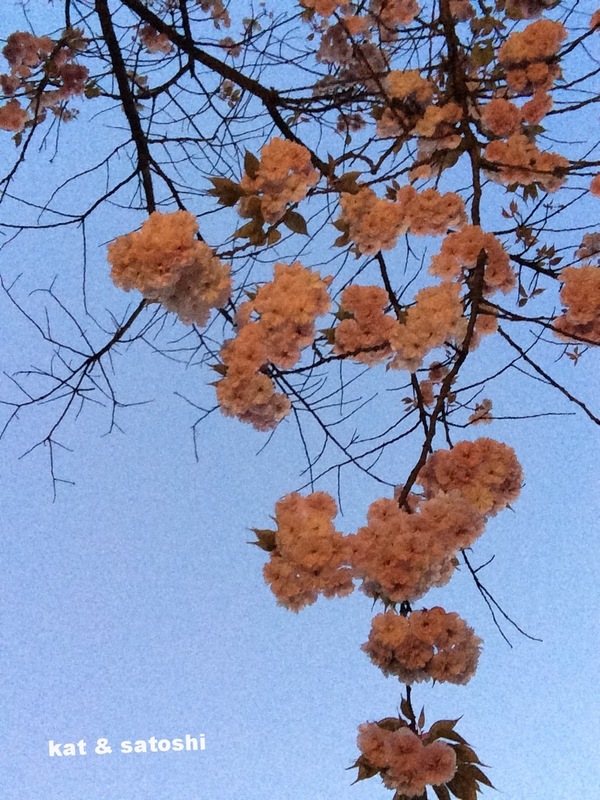 Though most of the blossoms had fallen it was still really beautiful! Even though the whole day was overcast, I'm glad we got to visit Satoshi's grandfather's grave and also got to see some new sights and some cherry blossoms...have a nice week! 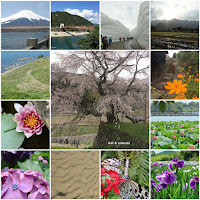 Wednesday, I went to Shonai to check out a park that I've seen from the train many times. If I'm not mistaken, it used to be the property of Panasonic. Every time we pass by on the train, there is no one in the park. 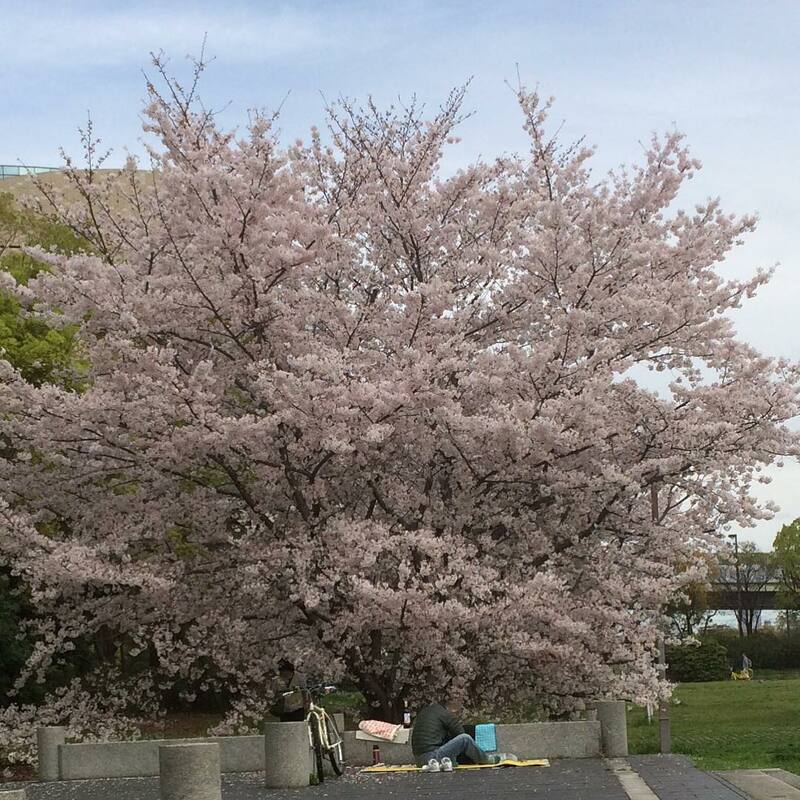 Even with the cherry blossoms, no one. Well, I figured out why no one is there, they have so many "no" rules at their entrance. No wonder no one is there. Luckily, when I visited there were people sitting here and there on the benches that they have there. Too bad they don't allow eating, it would've been nice to picnic under the trees. I shot a short video of the area here. After checking out the park, I walked to SidMid, a soup curry shop for lunch. I ordered the kakuni (braised pork) curry...950 yen (plus tax). This came with some saffron rice and a drink of your choice. 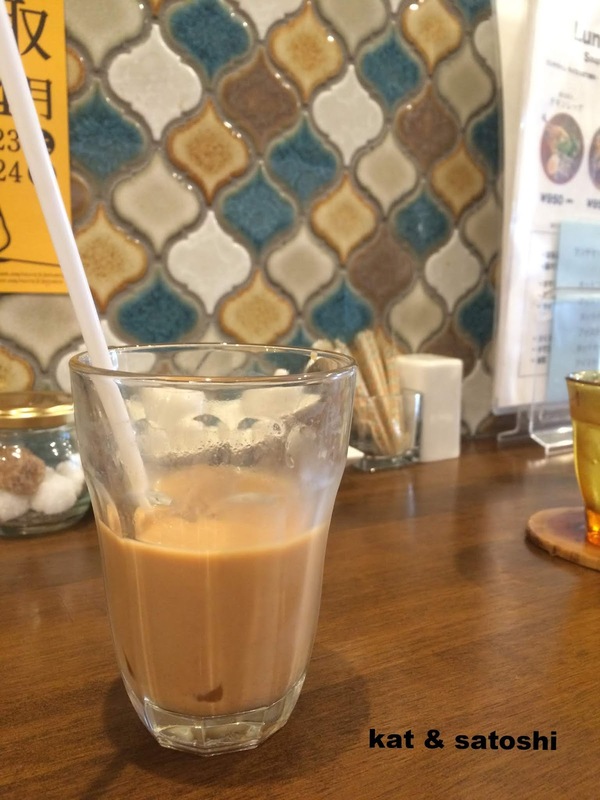 Since the weather was quite warm, I chose their iced chai. The pork could have been cooked a little longer, the bottom part of the piece was quite tough, while the upper part was tender. When you order you can choose your spice level (1-10), the first four are at no charge, five & six are an additional 100 yen, seven & eight are an additional 200 yen and nine & ten are an additional 300 yen. There was another customer there when I went and I think he must've ordered a really high level of spice because I could hear him coughing a lot. Me, I ordered my curry at level 2. The portion was quite filling, lots of vegetables and soup. Towards the end of my bowl, I noticed that there was something gritty in their soup. I would go back when I'm in the area but try something else on their menu. 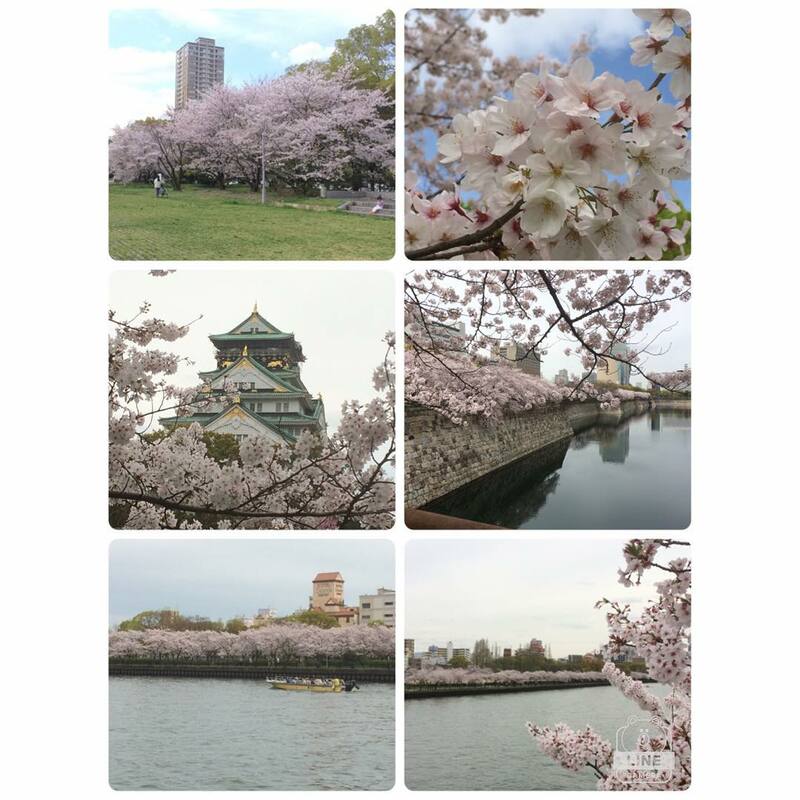 Yesterday I went to check out the cherry blossoms around the Osaka Castle area. It was quite overcast. I started at Naniwanomiya Park. This park which I stumbled upon a couple years ago, was once the property of the Naniwa Palace. If you are interested there is more info on the property here. 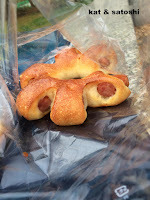 I had picked up several snacks from Boulangerie Lien to enjoy at the park. 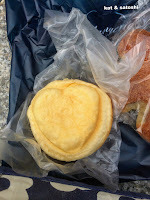 This custard filled cream pan...was still a little warm, so good! And this sweet chili sausage bread. Chewy baguette filled with a snappy sausage and coated with sweet chili sauce...this was messy but good. As I was sitting and taking in the scenery, I noticed this man who had a tree all to himself. 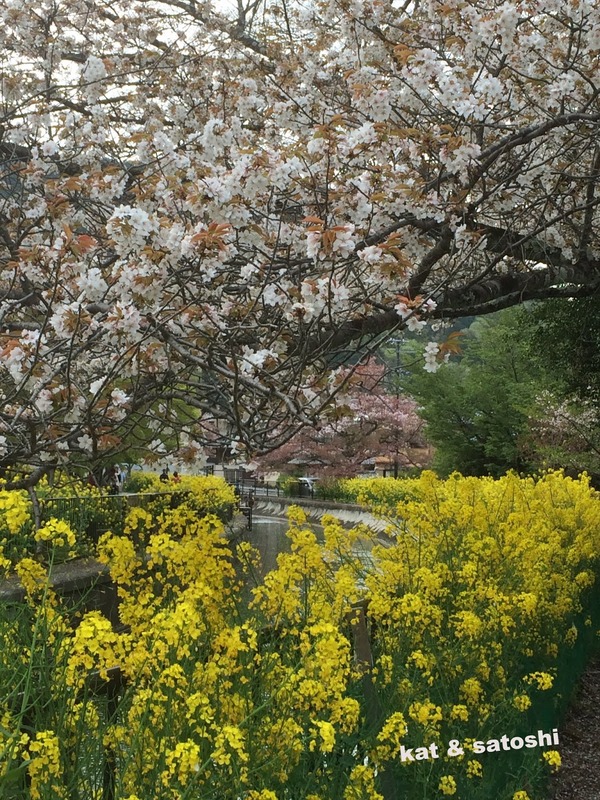 I then walked the perimeter of the Osaka Castle property. 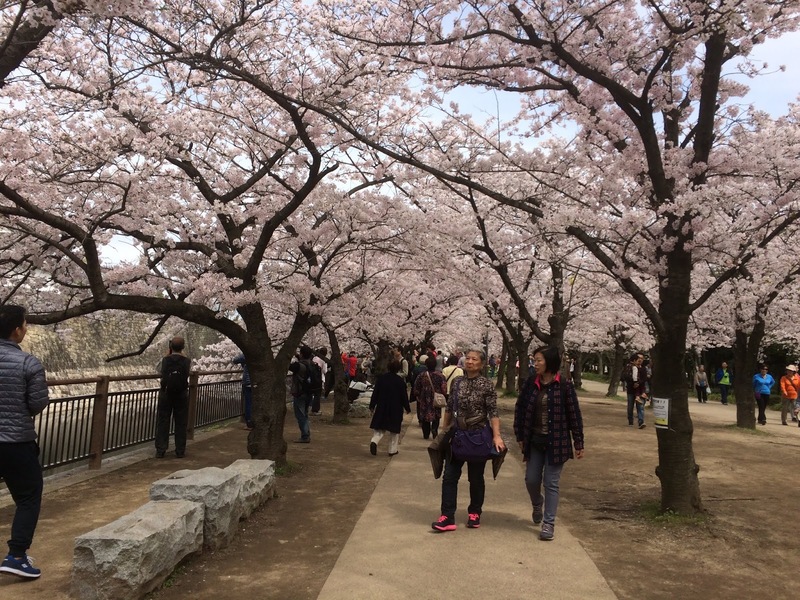 Even though this photo doesn't show it, there were tons of people taking in the blossoms. 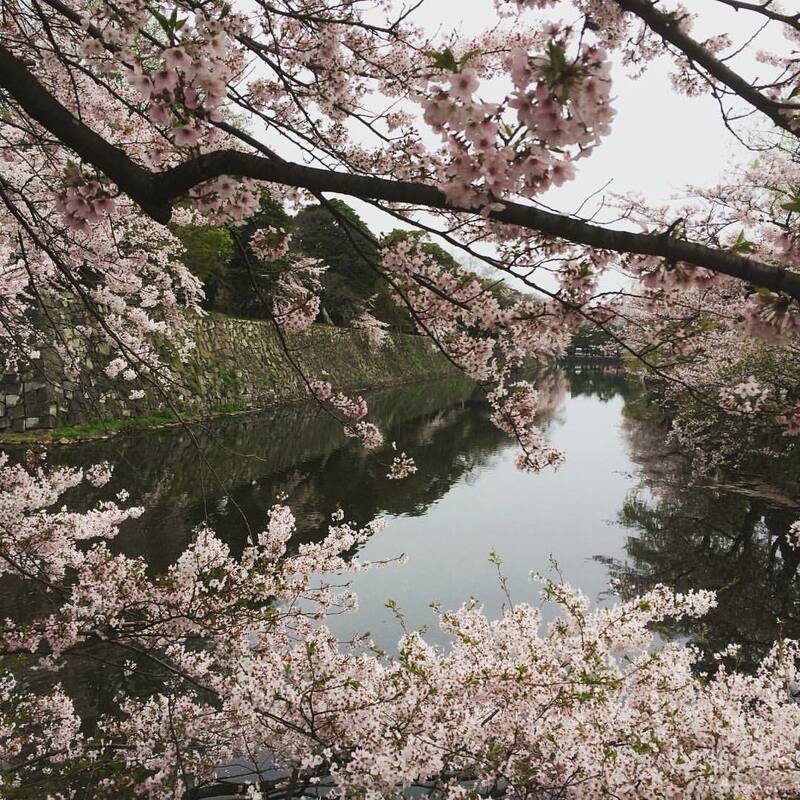 And then I made my way to the Oogawa, a large river in Osaka that has cherry blossom trees on both sides...for a panorama pic. Lots of walking, and even though it was overcast, it was still nice to be out and about. 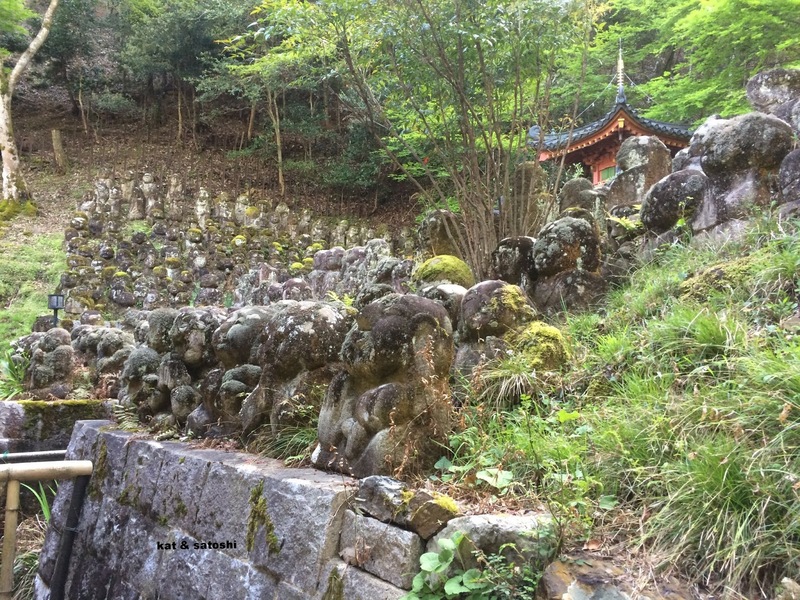 The tour started out with a visit to the Fujiwara Imperial Site. 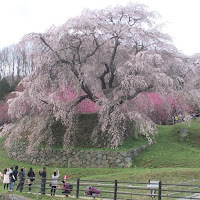 This area was once the site of the capital of Japan, long, long, ago. 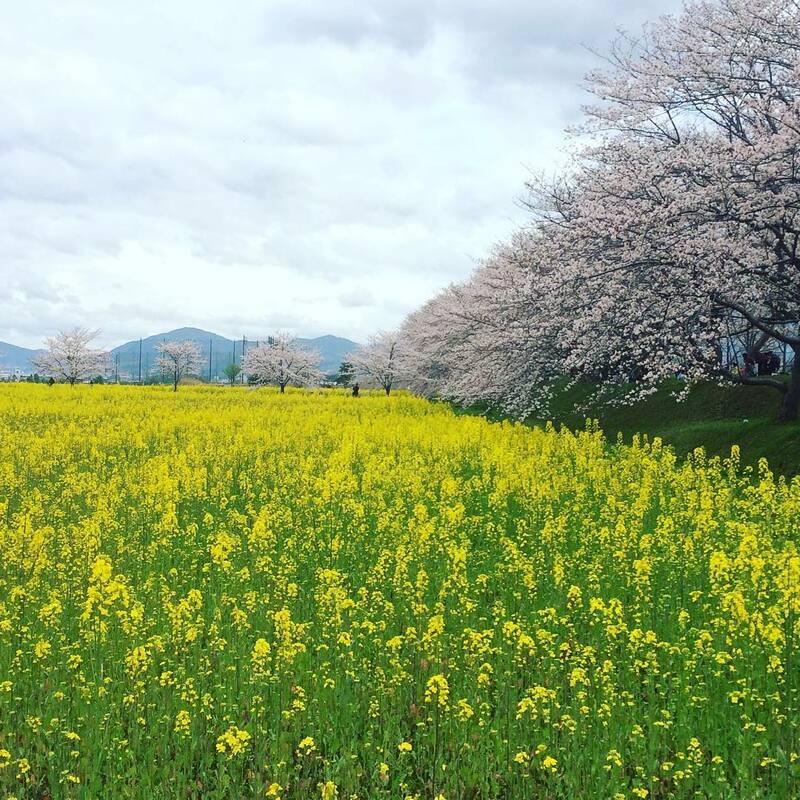 During the Spring, there are over 2.5 million rapeseed blossoms. 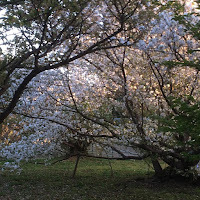 There are also huge cherry trees. Perfect for picnic-ing under. This is how it looks from about the middle of the field. 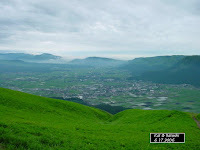 The next stop was Hozoji. 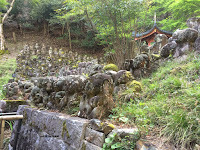 A temple located in a remote area of Nara. 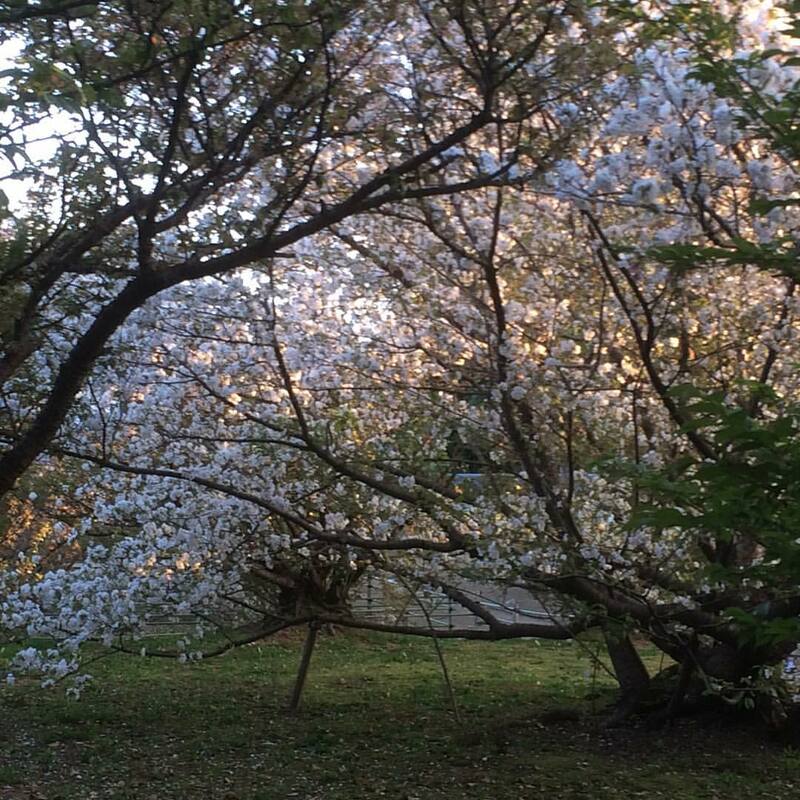 Which apparently has the same DNA of the cherry tree at Daigoji in Kyoto. 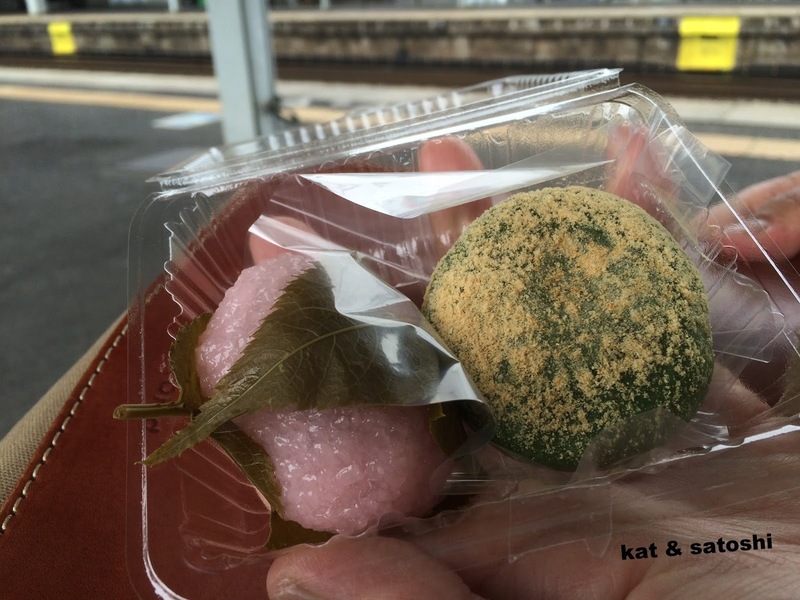 A light meal was provided...kaki no ha sushi (persimmon leaf sushi). 2 pieces of salmon and 2 pieces of mackerel wrapped in persimmon leaves...and some tea. 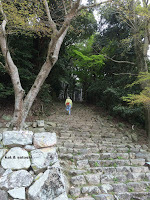 Then we backtracked a bit to see the Matabeizakura. You can get a feel as to how large the area is with this video here. Our last stop was Morino Yoshino Kuzu Honpo, one of the last three makers (in Japan) of kuzu (arrowroot). 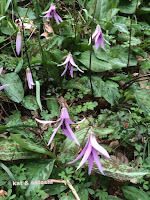 This property also has all sorts of flowers and herbs growing too. 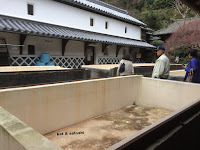 The kuzu (arrowroot) is extracted in these vats during the winter months. 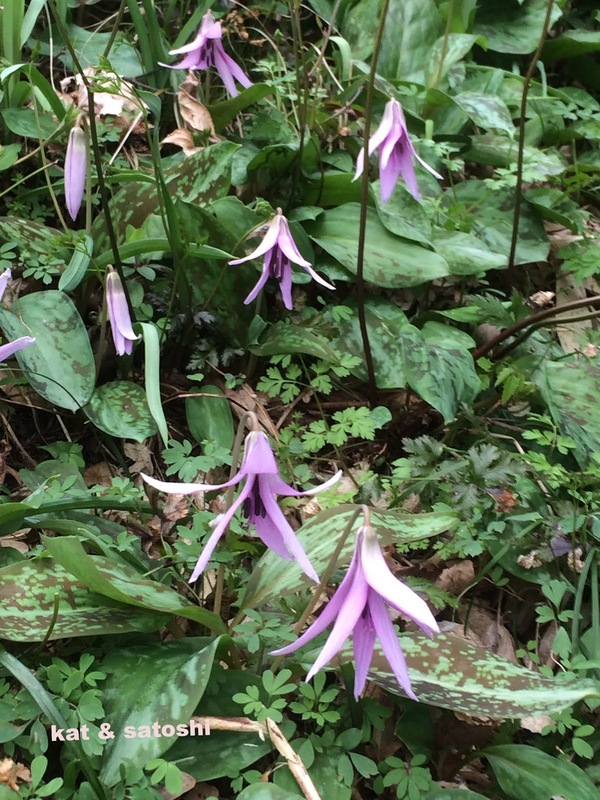 One particular flower on their property that we saw was katakuri (dogtooth violets) which is the ingredient originally used for katakuriko. 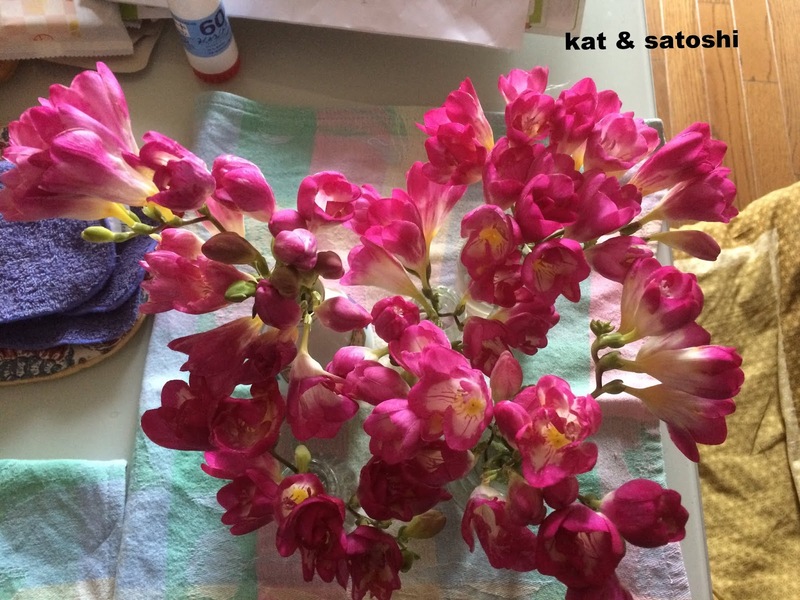 Katakuriko is translated these days as potato starch because the bulk of it is now made from potatoes, but originally the starch was extracted from these flowers. An interesting architectual feature of homes in this area are these sub-roofs called kemurigaeshi (literally return the smoke), over the kitchen areas these sub-roofs/vents would take the smoke from the kitchen outside of the homes. 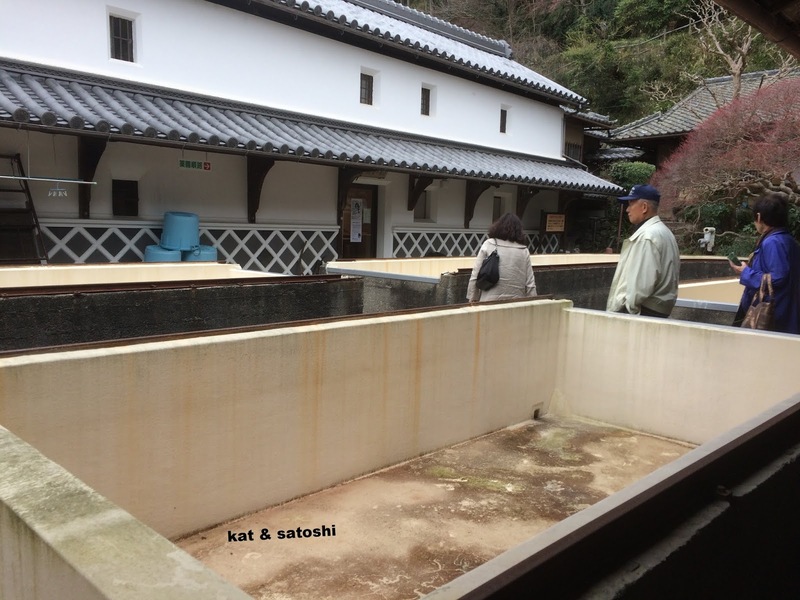 Since water is very clear and clean in this area, there are several shoyu and sake makers. 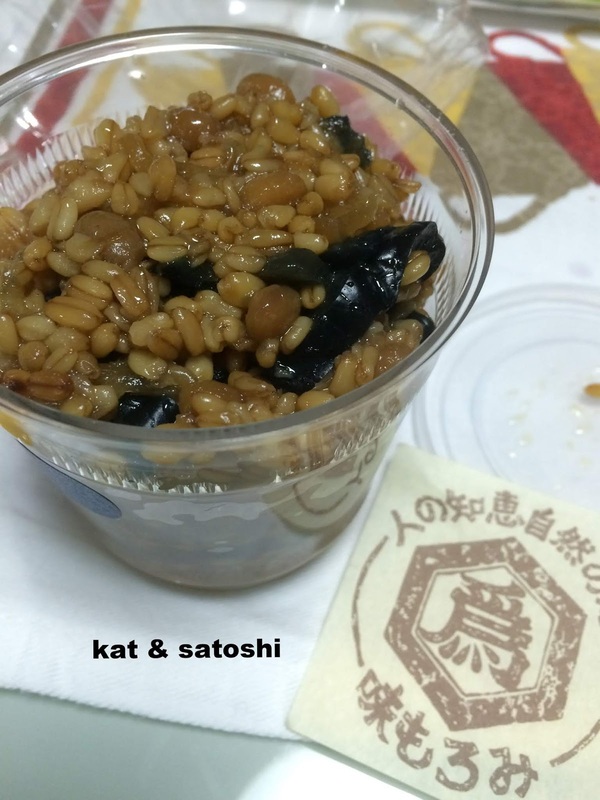 We bought some shoyu moromi (mash of soy beans that undergo fermentation with bacteria, yeasts and molds) from Kurokawa Shoyu to try, as it is supposed to be good with cut veggies and rice. 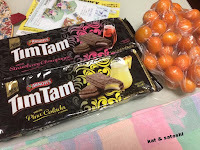 Everyone on the tour received a package of these sange. According to the explanation on the package, flower petals are scattered in order to worship all Buddhas during ceremonies at Buddhist temples. This is called "Sange". 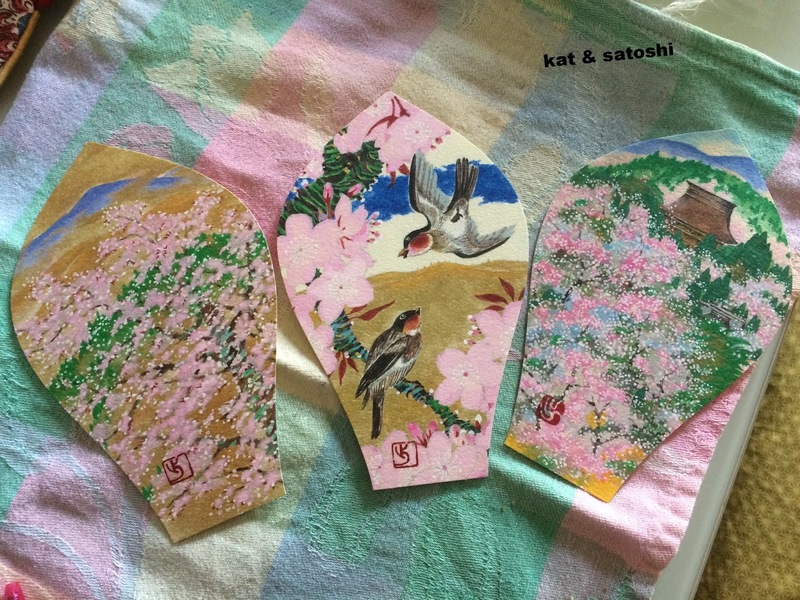 Originally fresh lotus petals were used but over time have been replaced by these lotus petal shaped pieces of paper. At special ceremonies, thousands of these multi-colored petals are scattered from the rooftops. Despite the forecast for rain, we were lucky that we only encountered some clouds and a slight drizzle. We enjoyed this tour because it was quite laid back and we were not rushing around to see everything. I hope you also enjoyed this as much as we did.